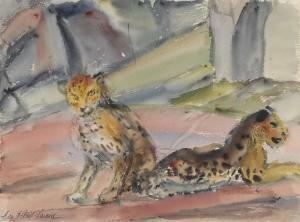 Find artworks, auction results, sale prices and pictures of Lou Albert-Lasard at auctions worldwide. in pencil. 425x557 mm; 16 3/4x21 3/4 inches, sheets, corner-mounted to passpartout. Oblong folio, contents loose as issued in publisher's cloth-backed illustrated boards, worn; some plates with very light foxing to margins, sometimes lightly affecting image. 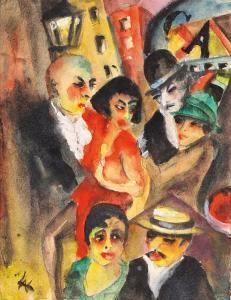 first edition of a scarce expressionist work. Circa 1922/25. Watercolour and gouache over pencil on paper. Marked with the estate stamp on the reverse: Lou Albert-Lasard. We would like to thank Dr. Ursula Prince, Berlin, for kindly providing additional information. 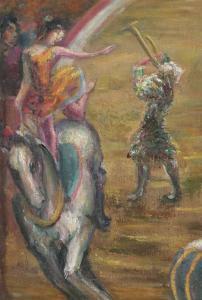 Cette oeuvre est attribuée à Lou Albert-Lasard (1885-1969). 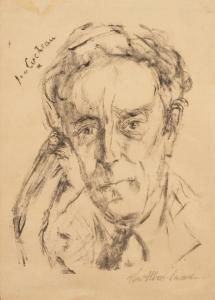 Elle est titrée Portrait de Jean Cocteau. Il est inscrit 'Jean Cocteau*' (en haut à gauche) et signé 'Lou Albert Lasard' (en bas à droite). 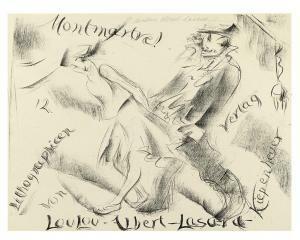 This work is attributed to Lou Albert-Lasard (1885-1969). It is titled Portrait de Jean Cocteau. Inscribed 'Jean Cocteau*' (upper left) and signed 'Lou Albert-Lasard' (lower right). 'PORTRAIT OF JEAN COCTEAU'; INSCRIBED UPPER LEFT AND SIGNED LOWER RIGHT; INK AND INK WASH ON PAPER.